Darryl, Bev & Brendan Back have confirmed they will be the major sponsors again in 2019 and we are once again truly grateful for all their amazing support. Well done to everyone who took part in last year's event and thanks for entering. Thanks also to all the leg sponsors, transition people, team managers, drivers, helpers and all the fabulous people who make this event what it is. We are looking forward to having another amazing weekend in the Naki with fantastic weather, a huge field and a heap of fun. Good nutritional advice for Training for the Event. Maggie Radich is a Registered Dietician and a Taranaki local that has started up her own Private Practice - New Plymouth Nutrition - after working at Base Hospital and in the UK. She has completed extra training on top of a Masters degree to be a Sports Dietician. Download Nutritional strategies by Maggie here. 100 Mile Solo Running Event - what an awesome effort by those that completed, some never having run that distance before. Check out Ultra runner Lisa Tamati's training. Due to the time and cost to put the photos up on the website we don't offer this option. What we are offering is if you contact us we will e mail your team photo for a small fee of $10.00. You can then share this with all the team or get some printed off. 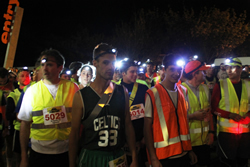 Email admin@eventstaranaki.co.nz and let us know if you want a photo crossing the line or a group photo. Payment can be made via internet banking to Westpac account Events Taranaki 03-0713-0464761-01 with your team # as a reference. Trophy awarded to the first Business House team in the Walker, Composite and Runners category. If you are representing a business tick the Business House box. There will be a special prize for the "Best dressed team" and the "Best themed team"
Sport Taranaki School Challenge which offers reduced entry fees and the same rules and conditions as the Runners relay. 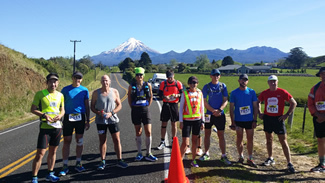 The Taranaki Steelformer's Around the Mountain Relay comprises of teams of between 10 and up to 18 members completing the 150km. There are 21 legs between 3 and 11km. You must have a minimum of 10 team members with a maximum of 18. There is no age limit for participation, however, participants under the age of 13 must be accompanied by an adult. The event will start from the TSB Stadium in Mason Drive New Plymouth on Friday night and will culminate with a prizegiving on Saturday November 2nd 2019 at 6.30pm. Get a team together and have a fantastic weekend in Taranaki in 2019. On Line entries and entry forms will be available from Sports shops and fitness centres throughout New Zealand from July 2019.